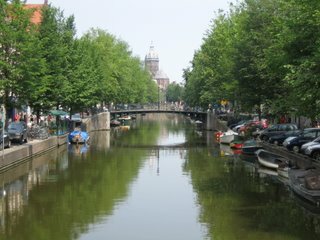 A typical river shot of Amsterdam...We don't have many pictures of Amsterdam...I wonder why?! Nicht so shnell! A shout and point at our trousers tells us we can't ride without leathers......great! Oh well there's always next time! Camping rough in a field in Germany. France - Morzine. 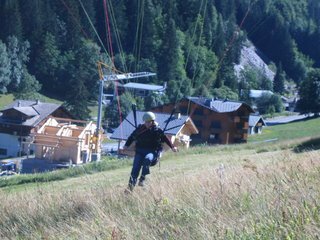 Our main reason for coming here was to attend a weeks paragliding course, however we did have some good rides out on the excellent roads around Morzine. 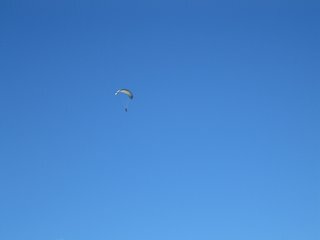 ....and landed, without falling over this time! 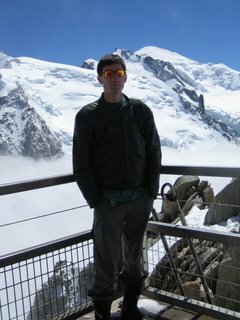 Mont Blanc, Chamonix. 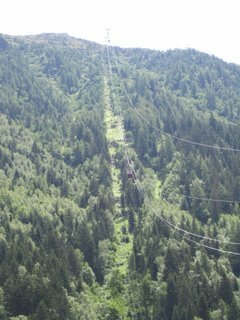 Bit steep for the bike so we took the cable car instead.....the pictures not that clear but it left you thinking perhaps the bike would have been safer! It's all worth it for the view though. We were glad of our bike jackets...It was freezing! 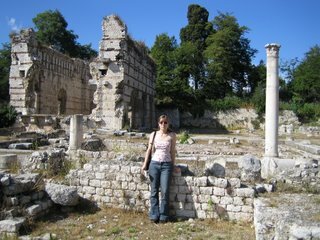 Nice was a bit rubbish, the only thing we thought was worth seeing was the Roman ruins, good old Romans! Florence. 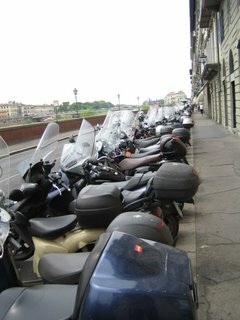 They are scooter mad in Florence, just one of the streets crowded with scooters! 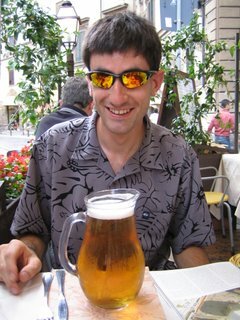 The biggest beer....plenty more where that came from in Italy! 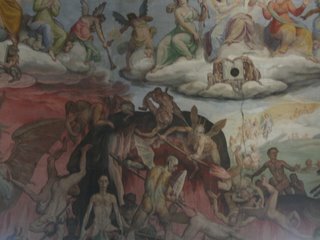 Good enough for an Iron Maiden CD cover......the ceiling in the Cathedral in Florence. 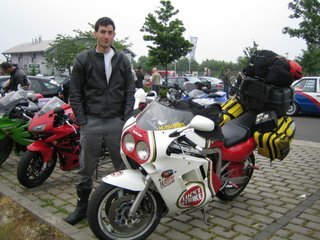 Traveling from Calais to Amsterdam at 160mph, using a tank of fuel every 25 minutes, behind a mad Danish guy we met at the ferry port on his way to Assen for the GP. The N88 through the Grand Central Massif in France where the surface is brilliant and the bends leave nothing to be desired. Needless to say we scraped pieces of bike on both sides! 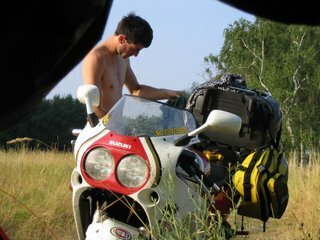 Battling with the irate Italians and the traffic in Turin. Le Puy-en Valley to Birmingham in 13 hours, just under 1000 miles. We had very numb bums for the majority of the journey and Cara fell asleep for the last few hours. 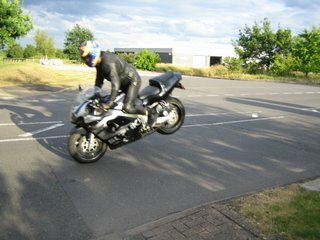 Keeping it below 140 mph on British motorways felt like snails pace! 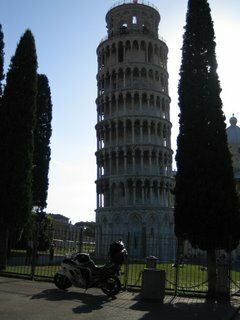 We won't be doing a tour on the bike this year as we have decided to go to India in November. However we will be visiting the Enfield Bullet factory so will post some pics on our return. The trusty Gixer that we completed our trip on is no longer with us as I have swapped it with a friend (Sonic) for this spritley young Srad 600. However I can't be without an 1100 so I have bought a later water cooled model. I love gixers. The Suzuki GSX-R1000's dominance are simple. Sublime, lithe ergonomics and handling, radical styling and full-on usable power. 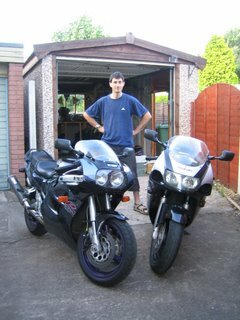 The bikes looks good too. Im thinking of buying one. gonna check out some motorcycle insurance quotes to see how much this beast is gonna cost me to get on the road. then i'll have to sweet talk the wife into letting me have one. Like what you guys have going on here, what a great site/blog. Im always on here seeing the latest news and updates.